Our tender chicken patty, topped with shredded lettuce, double slices of cheese and creamy mayonnaise, served on a long sesame seed bun. Everything a chicken burger should be. Score a catch of marvelous flavors of your tastebuds with this delightful burger. 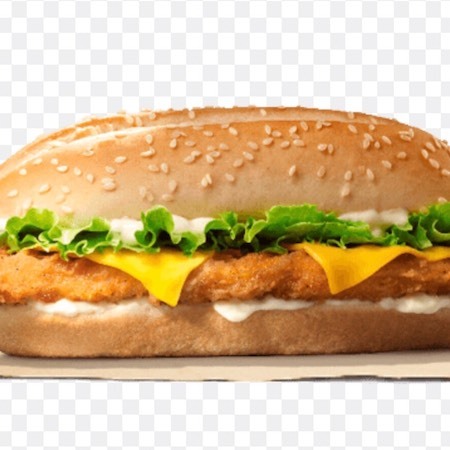 A succulent fish fillet is embraced by a whole slice of American cheese, and then topped with tangy tartar sauce to accentuate the fish's flavor and it's all served between a toasted sesame bun. A big bite of THE ENORMOUS made with flame-grilled 100% Australian beef patties or your choice of pork patties, topped with warm bacon, melted cheese, and two fluffy scrambled eggs will help you boost energy to power you through the day. Our BK™ Ultimate Breakfast Platter has all your signature favorites, including a mingling of warm scrambled eggs, crunchy Hash Browns, savory sausage, a warm baked biscuit, and three fluffy pancakes drizzled in sweet syrup. Our King CROISSAN'WICH® with Bacon is now made with 100% butter for a soft, flaky croissant piled high with fluffy eggs, two helpings of melted American cheese and thick cut naturally smoked bacon. Our King CROISSAN'WICH® with Ham is now made with 100% butter for a soft, flaky croissant piled high with fluffy eggs, two helpings of melted American cheese, and a hearty serving of sweet black forest ham. Our grab-and-go CROISSAN’WICH® PORK made with pork patties, fluffy eggs, and melted cheese on a toasted, flaky croissant. Score a catch of marvelous flavors of your tastebuds with this delightful burger. Two succulent fish fillets are embraced by a whole slice of American cheese, and then topped with tangy tartar sauce to accentuate the fish's flavor and it's all served between a toasted sesame bun. Not just for vegetarians, our great tasting BK Veggie is made with real vegetables and wholesome grains, beginning with a Veggie Patty and a variety of fresh-cut vegetables, topped with ketchup and mayonnaise.